As a Manufacturers’ representative specializing in cooling towers, Sys-Kool can help your company with your needs. Whether you are an engineer looking for assistance designing a building, or an end user looking to replace an existing cooling tower or fluid cooler, our expertise can help you find the cooling equipment for your project. With Evapco, we have access to any size or style of cooling tower or fluid cooler that you may need, and will work with you on customizing our towers to get you the best products for your application. The AT is an induced draft, counterflow design cooling tower with a CTI certified capacity range of 109 to 4,995 nominal tons (479 to 21960 kW). Standard construction consists of G-235 (Z-725 Europe) galvanized steel with type 304 or 316 stainless steel available for the basin or the entire tower. Independently certified to withstand seismic and wind load forces at ALL Building locations in North America. The UT is an induced draft, counterflow design cooling tower with a CTI certified capacity range of 112 to 4,995 nominal tons (493 to 21,960 kW). Standard construction consists of G-235 (Z-725 Europe) galvanized steel with type 304 or 316 stainless steel available for the basin or the entire tower. 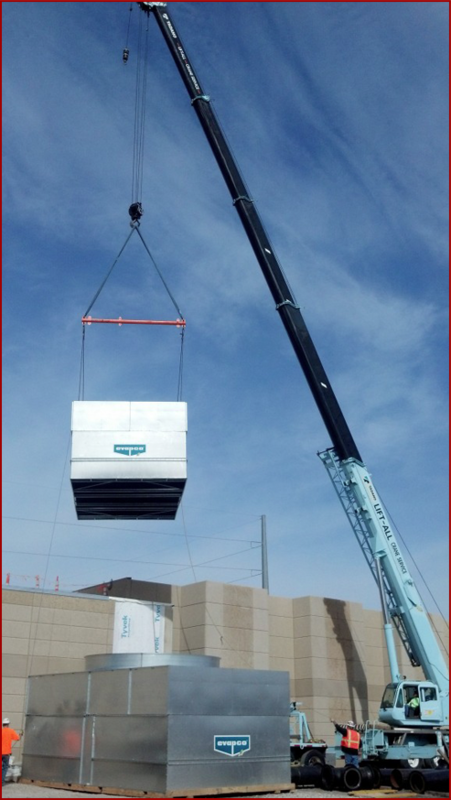 The UT cooling tower comes standard with the SUPER Low Sound Fan. The LSTE is a forced draft, centrifugal fan design cooling tower with a capacity range of 156 to 1,300 nominal tons (686 to 5715 kW). Standard construction consists of G-235 (Z725-Europe) galvanized steel with type 304 stainless steel available for the basin or the entire tower. The ESWB is an induced draft, counterflow design closed circuit cooler with a CTI Certified capacity range of 583 to 7264 MBH (171 to 2129 kW). Standard construction includes the patented, high efficiency Sensi-Coil® Technology featuring CrossCool™ Internal Tube Enhancement , EVAPAK Fill and G-235 (Z725-Europe) galvanized steel casing and basin. Type 304 stainless steel construction is available for the basin, the redistribution basin, or the entire unit. The AXS puts a new spin on induced draft, crossflow cooling towers with a CTI certified capacity range of 312 – 1,148 nominal tons. Standard construction consists of G-235 galvanized steel with type 304 or 316 stainless steel available for the basin or entire tower. All models are CTI Certified and IBC Compliant. The eco-ATW is an induced draft, counterflow design closed circuit cooler with a capacity range of 150 to 38280 MBH (42 to 10813 kW). Standard construction includes the patented, high efficiency EVAPCO Ellipti-fin Coil and G-235 (Z-725 Europe) galvanized steel casing and basin. Type 304 or 316 stainless steel construction is available for the basin or the entire unit.